So, after much adieu and not many updates on development, we’ve managed to whip that cool and “cutting edge” looking, but albeit pre-natal and rusty demo from four months ago into a “fully” working Beta product. We call it VisiLit Virtual Space, and it’s nowhere near complete, but myself and my new accomplice Ciarán Schütte are quite proud of it. I’ll spare you the gruelling details of the past few months of development in favour of a lovely explanation of what it does, how it works and how it’s helpful. If you want more detail on how it was build, look no further than here, the other 1000 word blog post I’ve written today. Essentially, this product provides an online collaborative virtual theatre space where the entire stage production cycle can take place. The people involved don’t have to be together in the real world, but can communicate, share ideas, and ultimately build their stage productions right there in the virtual, online world. Web technology has been becoming more and more powerful. Buzz words like “web app” and “cloud” are now commonplace. Our cloud based web app marks, in a way, the cutting edge of the potential of in-browser technology. The application itself is accessed using a simple URL in the address bar of an internet browser. (Currently, Google Chrome is the only browser we claim compatibility with). Here, after a brief loading period , the application is fully available for use! We take care of all of your files and because it is all online, it’s easy to work together with the others in your team! Our software is custom built for the production industry. We know that every team has many different members with many different roles and different ways of working. VirtualSpace caters for this. When a person is involved in a production, only tools and options relevant to their particular role are available to them. This means that the lighting designer can work away with his stuff, without having to worry about affecting the work of the set designer, or even having the bother of seeing any tools that don’t relate to the lights. This, of course, is true for any of the team who have access to the software. The roles of each member are managed by an easy to use admin area, controlled by the producer. VirtualSpace is a powerful visualisation tool, and because of this, even those who do not directly work within the application can log in to get a better idea for, and contribute to, the grand, shared vision. This is done simply by sharing a special link. Actors can view the planned performance, and give their two cents in terms of improvements that they envision. Here’s a peek at what the app looks and feels like. After a brief log-in procedure, we are brought to the main view for Visilit VirtualSpace. 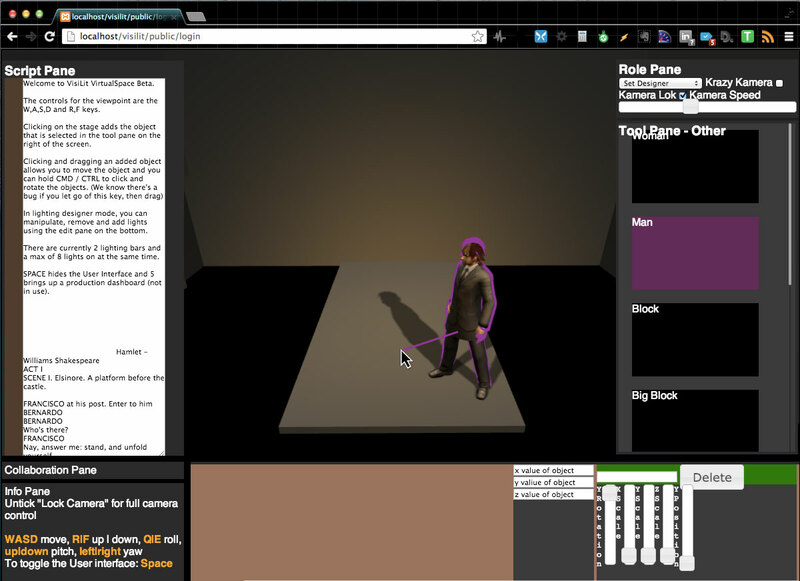 The interface, and the contents of the 3D Space will depend on factors such as whether you’re working on a production and what your role is for that production. This view will always be roughly the same and is easy to recognise. It will act as the central visual space for the app, everything else is accessed in some form by traversing through this space. As we guide you through the elements of the user interface, please bear in mind that our product is in a very early “Beta” stage, and as such, is very much a work in progress. The interface itself, as well as the number and scope of the tools it contains will evolve massively as we continue to validate the product. 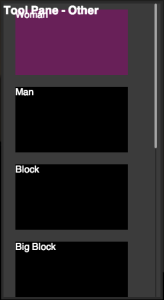 This role pane is a simple place for global tools. its main purpose is to give us a place to log out or change your account information. Some people in the production, such as the production manager, may have access to more than one or even all of the available roles. For these people, they will be able to select which role they would like to work under. Other uses for this pane currently include camera and work light controls. No matter what your role, when working on most stage productions, the script will act as the central hymn sheet for everybody involved. Virtual Space is no exception. Here, in the script pane, Every line can be viewed, and edited if needed. Every change under each of the role categories of set designer, lighting designer, stage manager, venue manager, production manager and driector is marked here, pinned to a certain line in the script. In this way, we can easily scrub forward or backward through the production, with an awareness of each persons work and how that will affect the production. Because the script pane provides a way to visualise the production as a whole, we feel that it is necessary for each person to be able to jump between events that are relevant only to their own work. This is the purpose of the States Pane. A “state” – as we call it, is a particular arrangement or combination of settings per role, so for a lighting designer, this would reflect the condition of the lights at any particular point. States can be created, deleted and selected for viewing and editing from this pane, and each state change is also reflected by a pin point on the script. 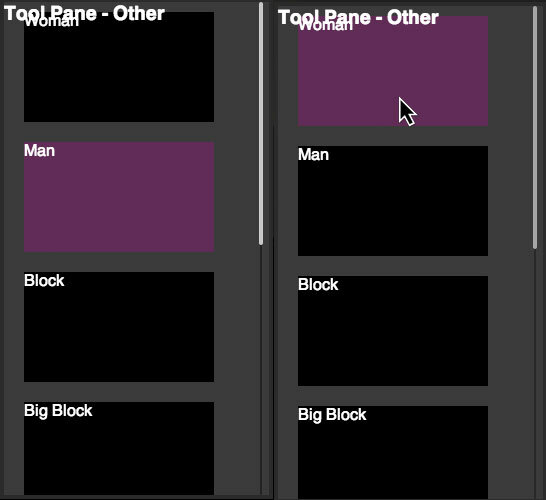 So there’s two ways to navigate the production; the script pane, where you see pin points for everyone’s work, and the state pane; where the pin points for only your own work are reflected. 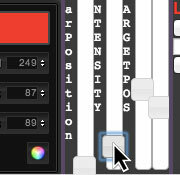 This allows you to avoid clutter of elements of the production not related to yourself. These two areas work hand in hand. 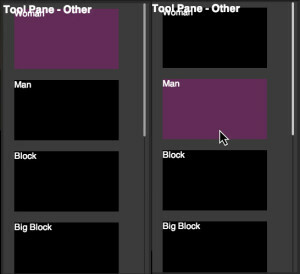 The tool pane, on the right, serves as a place from which you can select elements to add to the production. This is base on your role, so the stage manager will be presented with a list of available actors, where as the set designer will have available elements for creating the set. The edit pane, allows the editing of the currently selected element. 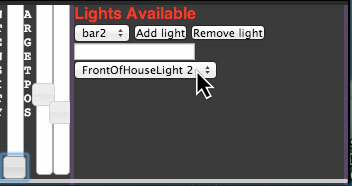 For the lighting designer, this will be an extensive set of controls for lighting. For the set designer, for the time being, we allow the altering of physical dimensions of basic shapes that can be added to the scene. We can also use 3D models, of which only two are currently available. In the near future, we intend to not only expand this number, but add the capacity to upload custom 3D models. Let’s run through a basic few actions. Adding some characters, and adjusting a light. 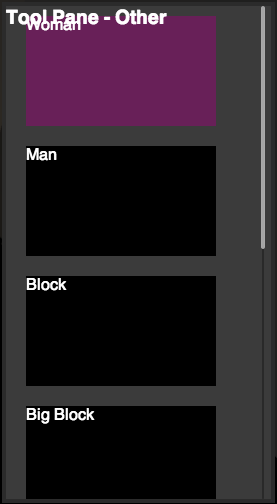 We are in a mode where we have access to all roles, starting with stage manager mode. Zoom in to get a better view. 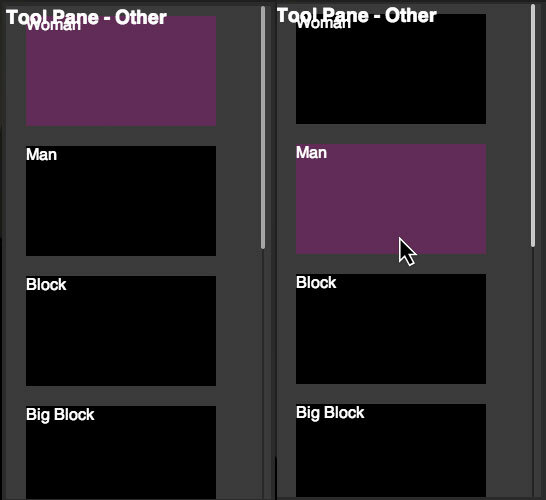 Lets select to add a man from the tool pane. Remember, now we are in stage manager mode. Now let’s place him in somewhere. 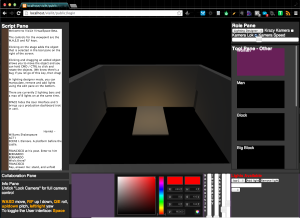 Now let’s switch roles to lighting designer mode. 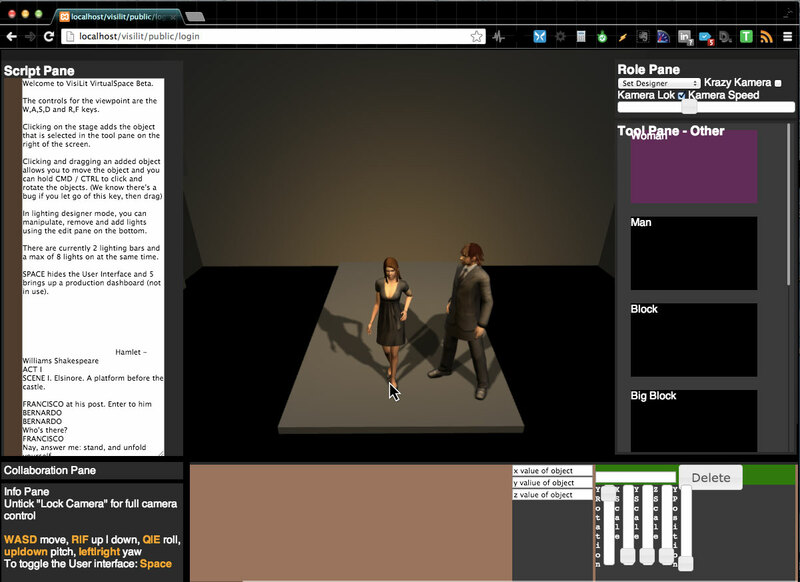 (Remember that we have access to all the role permissions in this demo. Most people wouldn’t. Usually, this part would be a different user). and voila, we can see the scene be affected! Again, we must iterate that these tools will evolve (and hopefully improve!) based in increasing development and the good feedback from our customers. For example, already we know that we wish to improve the user interface for lighting by providing a 3D section in the edit pane from the point of view of the light itself, to allow easier targeting. Currently, the software is collaborative in the sense only that when somebody else saves a state and then you re-load that state, will you see the changes they have made. We wish to improve upon this by allowing real-time collaboration, so that you will see that lighting designer’s light moving and changing colour as they do it, or marvel at the sight of a beautiful young virtual actor moving around the stage as the stage manager tweaks to find the right location for that scene. 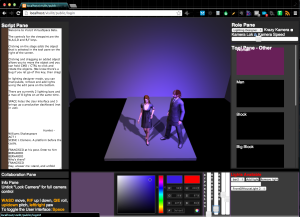 For this, we need to significantly beef-up the technology running in the backend, but when it’s done we will be able to provide a truly amazing virtual production experience. On the topic of collaboration, we have yet to implement a system for managing live chat and message posting, which will allow virtual space to really become the central place for communication throughout the production process. We wish also to begin to build a library of existing theatres throughout the world, to allow customers to get working fast. We want, also, to provide a growing library of pieces of set, props and lighting setups which can make the workflow even easier. All in good time I guess! VisiLit is going to Confex!